The Web3D Consortium is showcasing the latest enterprise solutions for open interactive and Immersive 3D solutions from August 12-16 at the SIGGRAPH 2018 conference in Vancouver, Canada. X3D Graphics content can be used in multiple application domains including medical, entertainment, education, 3D printing & scanning, design, and geographical information systems. Join us (and grab a bookmark) when we showcase X3D as the backbone for the new dimensions of 3D! Web3D Consortium members have achieved another successful year in many ways. Our new partnership with HL7 is aimed at incorporating 3D Presentations into Electronic Health Record (EHR) applications, further improving X3D as the backbone for 3D informatics and building out new dimensions on the World Wide Web. Join us at our SIGGRAPH Birds of the Feather sessions as we discuss improvements and extensions for: Physically Based Rendering, and Virtual, Augmented and Mixed Reality (VR/AR/MAR) in the Medical, Geospatial, Design, Printing and Scanning domains. The open Extensible 3D (X3D) Graphics Standard provides a robust and durable medium for the implementation of multimedia 3D systems on the Web. 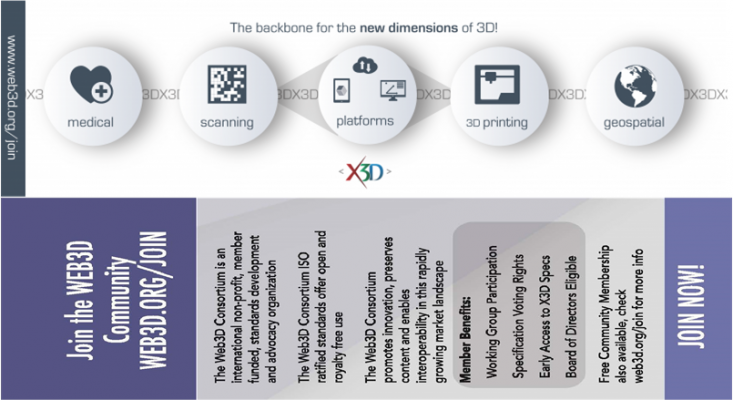 Web data-integration capabilities and a rich set of componentized features for X3D are steadily expanding. New innovations and cross-platform Web applications again prove that X3D is a compelling, interoperable technology ranging from mobile devices to interactive networked virtual environments to large-scale CAVE displays. Our X3D is the leading royalty-free standard and run-time architecture to communicate 3D scenes on the Web. The non-profit Web3D Consortium is open to all: companies, universities, agencies and individuals are welcome to join the Web3D Consortium and contribute to the standard. We look forward to your participation. Meet the Web3D community at SIGGRAPH 2018 for this great opportunity to learn more and get involved! There has never been a better time to join the Web3D Consortium and build 3D into the future Web. The Web3D Consortium is a member-driven and funded open consortium involved in many technical initiatives across the 3D value chain. The Consortium is committed to the creation and deployment of open, royalty-free standards that enable the communication of real-time 3D graphics.